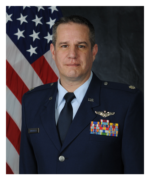 Lieutenant Colonel Rocco J. Angiolelli is the Chief, Defensive Operations, 603rd Air Operations Center, Ramstein Air Base, Germany. In this capacity, he leads seven Airmen responsible for the real-time monitoring and execution of air and space power missions. His plans, coordinates and executes combined/joint theater missile defense for both USEUCOM and USAFRICOM areas of responsibility, and is the Joint Force Air Component Commander’s primary representative for integrated air and missile defense mission execution. In 2017, Lt. Col Angiolelli had the best operations rate in four years that protected 112 million people in 32 million square miles. Lt. Col Angiolelli refined the BMD defense design in seven joint/coalition exercises and command and controlled 300 simulated missile intercepts that validated EUCOM tactics, techniques and procedures (TTPs). During this time, Lt. Col Angiolelli monitored over 75 actual theater ballistic missile launches and briefed senior leaders, defending six million civilians from missile threats. Lt. Col Angiolelli also updated the command and control system architecture/reporting and solidified 11 TTPs for 30 international partners’ defense. Lt. Col Angiolelli also led Integrated Air and Missile Defense for the largest Command Post Exercise in the DoD and drove defense solutions to EUCOM. Lt. Col Angiolelli is a 2003 Distinguished Graduate of the Air Reserve Officers Training Corps and is a Senior Air Battle Manager with over 1,500 flight hours. He has controlled global air operations to include mission sets such as weapons control, surveillance, identification and high value airborne asset employment during multiple operational combat deployments in both the E-3B/C Sentry and Control and Reporting Center. Prior to his current assignment, Major Angiolelli attended Air Command and Staff College in residence program at Maxwell AFB, Alabama, graduating in June 2016.